Alright I pretty much dislike phones but my current Samsung celphone's battery has retired for good (6 years old) so I had to purchase a new one. 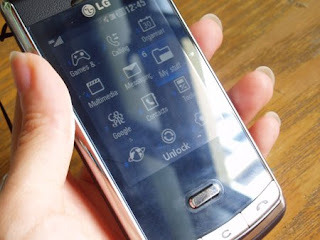 I upgraded to this shiny new thing: a LG KF750 Secret phone from South Korea. It is a slider design with 3G capabilities, touchpad navigational buttons, lcd screen, does bluetooth, video calls, google tools including blogger, maps and search, mp3 player, media player, a 5.0 megapixel flash camera that also records video. 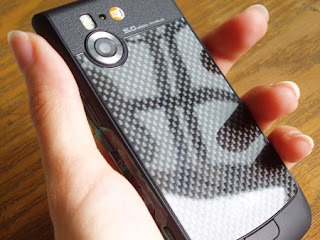 The back is carbon fibre casing with a reflective design. The default games are played by shaking the phone left right, up down. Of course you can download your own games into the phone too. You can add a memory card up to 4 gigs should the phone's memory be insufficient for your videos, music and games. I found the bluetooth wonderful, so easy to transfer files from my computer to the phone without the use of a USB cable! Your computer has to have bluetooth enabled too. The chimes from pressing the keypad while SMSing is a nice change from beep boops. The packaging is very nice; wires and stereo earphones come in separate boxes within the big box. The bad: More colours other than black-silver (iphone lookalike sorta) will be nice. Also it does weigh alittle heavy with all the solid functions. As with all touchscreens, fingerprints on glass annoy me to no end. They include a little screenwiper to clean the glass, but I'll need to replace that shortly! Also the touchpad is not quite obedient, my problems are the right buttons; I always press the top right button when I meant for the lower right button as they are placed closely together. Other times the wrong menu comes up because I had merely tickled the touchpad by accident. If you are looking to compare the LG Viewty with the LG Secret, the Viewty's back profile resembles a real camera (zoom lens and all that) and it is a full touchscreen without a keypad. The Viewty feels flimsier though it is lighter & width is thicker. It also comes in a different colour other than black. Verdict: Love it! And at a bargain, S$98 for the phone if I signed a 2-year continuation of my current phone plan. The promo I had came with a free $300 Kenneth Cole watch too. Edit! : Well now I have some problems cropping up after 2 weeks of use. First, the battery life is much shorter than expected (2 days without much use) and it dies after about 18 photographs (no flash). Second, it's hard to transfer my files from the phone to my computer, as the bluetooth goes one-way from computer to phone. Much hassle needed, the software included in the CD is useless. Third, I wish I could shut off or lower the volume of the shutter sound when I'm taking photos. Fourth, the touchscreen pad is slow to respond and even with my small fingers the navigational buttons are placed too closed together and you often end up touching the pad even when you don't mean to. you got a watch too lol, gimmeh. 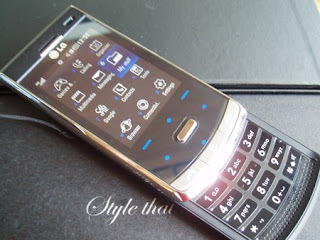 What a great phone..You know what? If I had something like that..I wouldn't know how to use it..I am so slow with all these type of things..lucky I have a blog and sometimes I can't figure that out..ha, ha..